Have you ever seen a LadyBug and wondered what the cute little bug with the dots on her back was thinking? And why she seemed in such a rush? Well here is your chance to peek into her thoughts and enjoy some of her daily triumphs and disasters. "Little Mrs. Ladybug was a worker. Nobody could deny that. 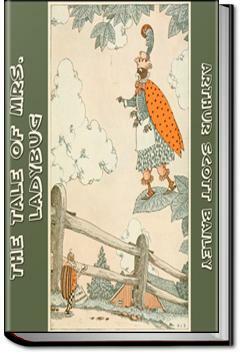 To be sure, she had to stop now and then to talk to her neighbors, because Mrs. Ladybug dearly loved a bit of gossip. At the same time there wasn't anyone in Pleasant Valley that helped Farmer Green more than she did. She tried her hardest to keep the trees in the orchard free from insects. Some of her less worthy neighbors were known sometimes to say with a sniff, "If Mrs. Ladybug didn't enjoy her work she wouldn't care about helping Farmer Green. If she hadn't such a big appetite she'd stop to chat even more than she does now. . . .And that was a most unusual thing with him. However, he could think of nothing but Mrs. Ladybug and her unkind speeches. And at last, meeting Betsy Butterfly herself along towards sunset, he stopped to tell how well she was looking and how charming her colors were. "I can't help it," he replied heartily. "Everybody's not like you," Betsy Butterfly told him. "Then you've been hearing about Mrs. Ladybug!" he cried. "Somebody has been tattling." "It doesn't matter," Betsy Butterfly assured him. "Perhaps it's good for me to know that everyone doesn't admire me." Buster Bumblebee didn't agree with her. "I'll have to speak to Mrs. Ladybug," he declared. I enjoyed this book. DD2 didn't, so I never finished it though. A harrowing story of beetles in the potato patch and overweight, aggressive June bugs. I've been traumatised for life. Pre-read for my son. He's going to be please to continue on the adventure through Farmer Green's Orchard world.